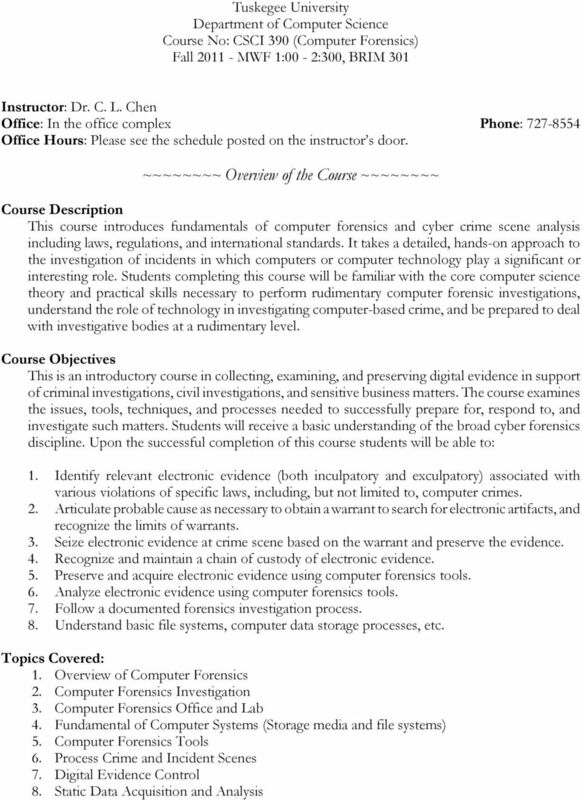 Download "Tuskegee University Department of Computer Science Course No: CSCI 390 (Computer Forensics) Fall 2011 - MWF 1:00-2:300, BRIM 301"
3 While you are attending the class, you are expected NOT TO < turn on the cellular phone < use the cellular phone < play games < surf the Internet unless you are instructed to do so < use any instant messenger or other means to chat with other users online < use of profane or inappropriate language Any violations to these rules will result in a 2 point deductions and/or disqualify you from bonus activities. Assignments Assignments are chosen to prepare you for practical and theory examinations in this course, requirements in other courses and work assignments in the real world. You are on your honor that the work you turn in is the work you have done by yourself. This is the foundation of your career as a computer scientist; therefore, take the time to develop the necessary professionalism as a productive citizen. Research Project Each student is required to choose a research topic related to digital forensics and submit a report of his/her research result. 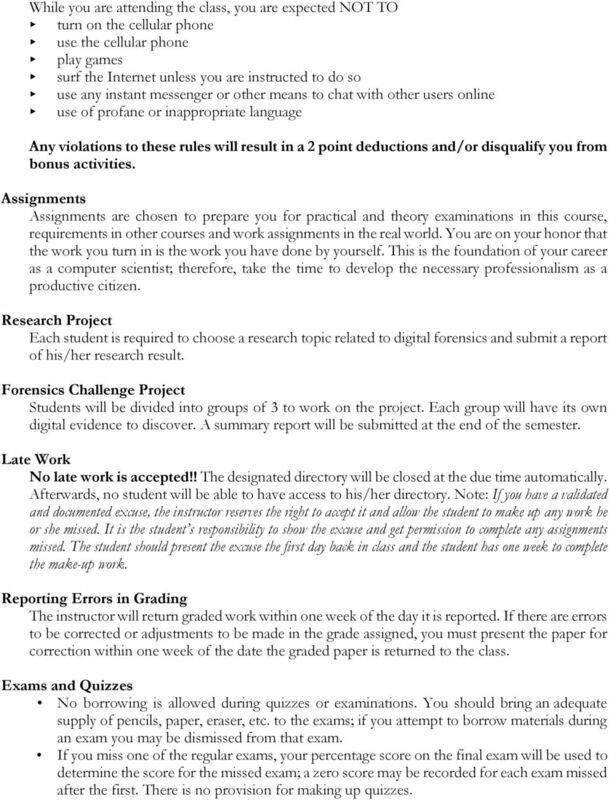 Forensics Challenge Project Students will be divided into groups of 3 to work on the project. Each group will have its own digital evidence to discover. A summary report will be submitted at the end of the semester. Late Work No late work is accepted!! The designated directory will be closed at the due time automatically. Afterwards, no student will be able to have access to his/her directory. Note: If you have a validated and documented excuse, the instructor reserves the right to accept it and allow the student to make up any work he or she missed. It is the student s responsibility to show the excuse and get permission to complete any assignments missed. The student should present the excuse the first day back in class and the student has one week to complete the make-up work. Reporting Errors in Grading The instructor will return graded work within one week of the day it is reported. If there are errors to be corrected or adjustments to be made in the grade assigned, you must present the paper for correction within one week of the date the graded paper is returned to the class. Exams and Quizzes No borrowing is allowed during quizzes or examinations. You should bring an adequate supply of pencils, paper, eraser, etc. to the exams; if you attempt to borrow materials during an exam you may be dismissed from that exam. If you miss one of the regular exams, your percentage score on the final exam will be used to determine the score for the missed exam; a zero score may be recorded for each exam missed after the first. There is no provision for making up quizzes. 4 Tentative Examination Schedule Two regular exams will be given during the semester. They are tentatively scheduled below. The time and place will be announced in class in case of changes. 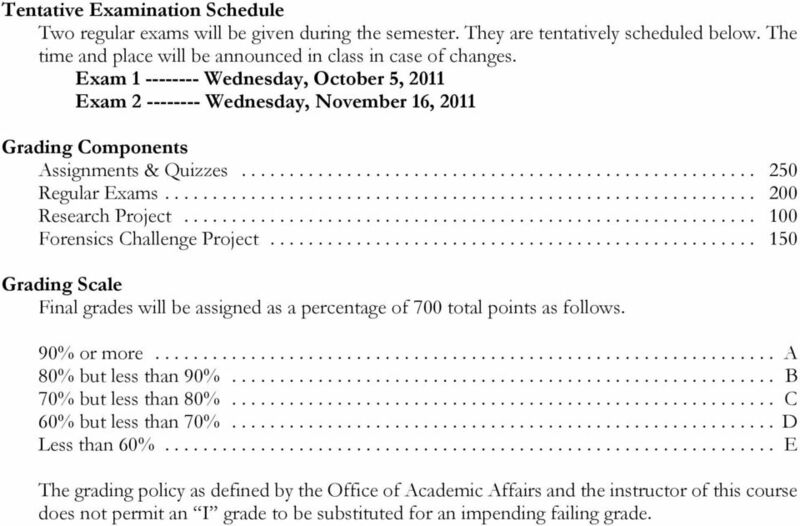 Exam Wednesday, October 5, 2011 Exam Wednesday, November 16, 2011 Grading Components Assignments & Quizzes Regular Exams Research Project Forensics Challenge Project Grading Scale Final grades will be assigned as a percentage of 700 total points as follows. 90% or more A 80% but less than 90% B 70% but less than 80% C 60% but less than 70% D Less than 60% E The grading policy as defined by the Office of Academic Affairs and the instructor of this course does not permit an I grade to be substituted for an impending failing grade. 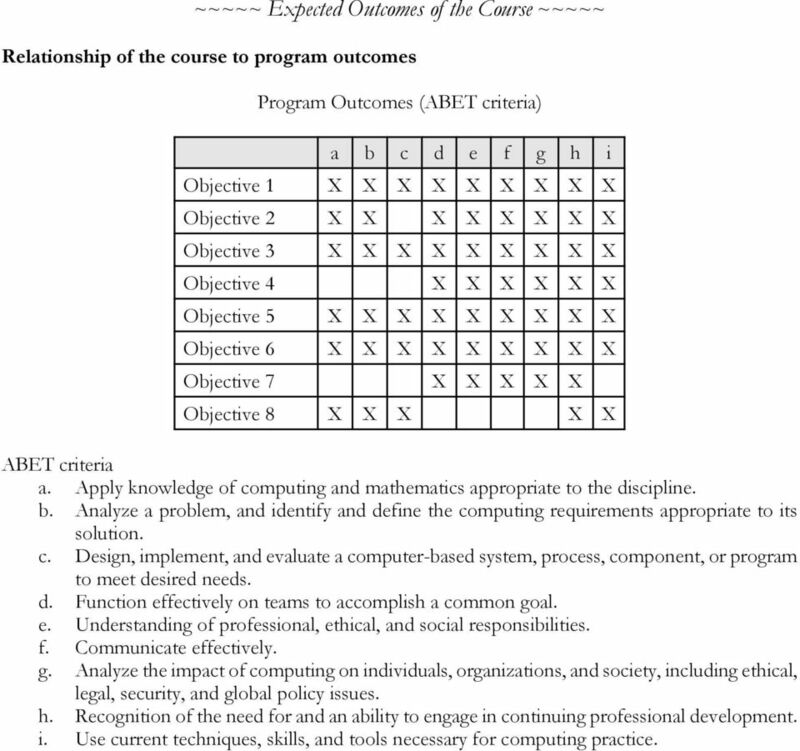 5 ~~~~~ Expected Outcomes of the Course ~~~~~ Relationship of the course to program outcomes Program Outcomes (ABET criteria) a b c d e f g h i Objective 1 X X X X X X X X X Objective 2 X X X X X X X X Objective 3 X X X X X X X X X Objective 4 X X X X X X Objective 5 X X X X X X X X X Objective 6 X X X X X X X X X Objective 7 X X X X X Objective 8 X X X X X ABET criteria a. Apply knowledge of computing and mathematics appropriate to the discipline. b. Analyze a problem, and identify and define the computing requirements appropriate to its solution. c. Design, implement, and evaluate a computer-based system, process, component, or program to meet desired needs. d. Function effectively on teams to accomplish a common goal. e. Understanding of professional, ethical, and social responsibilities. f. Communicate effectively. g. Analyze the impact of computing on individuals, organizations, and society, including ethical, legal, security, and global policy issues. h. Recognition of the need for and an ability to engage in continuing professional development. i. 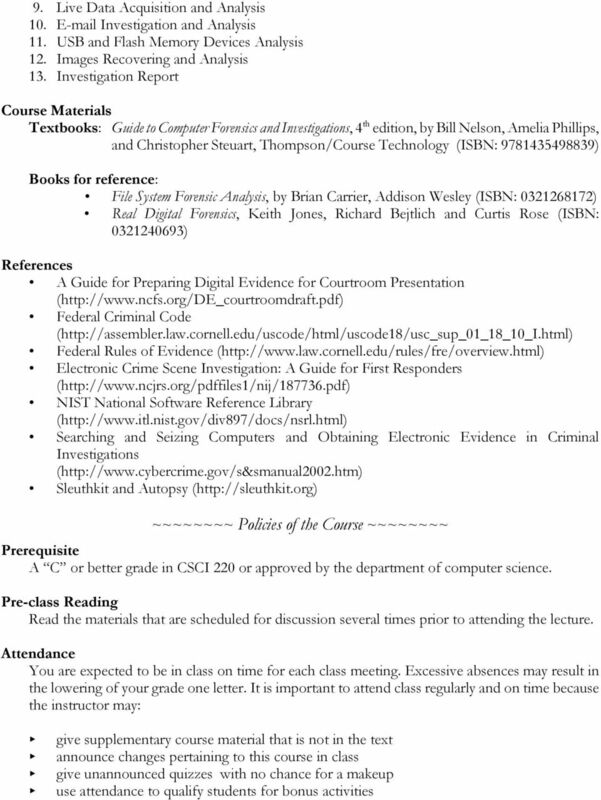 Use current techniques, skills, and tools necessary for computing practice. FINC 6532-ADVANCED FINANCIAL MANAGEMENT Expanded Course Outline Spring 2007, Monday & Wednesday, 5:30-6:45 p.m.
ECE475 Control System Analysis ABET Syllabus. ECE 326. Prerequisite topics: knowledge of Laplace transforms and Bode plots.